Having betta fish can easily change the look of your aquarium. This is because of their colorful nature. Well, for them to remain adorable, you have to consider giving the fish the right living environment. When it comes to the best environment, we are looking at clean water, enough food, some nice décor, and also having warm water. 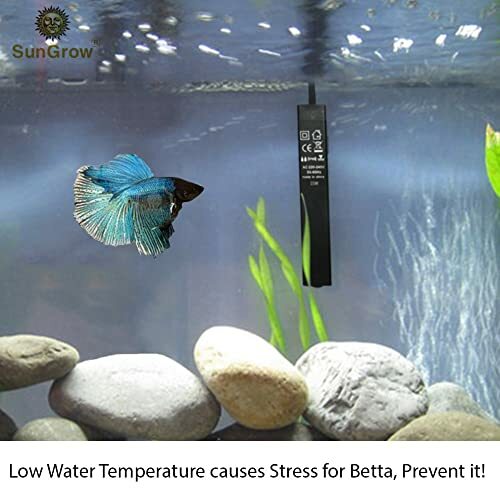 To have the water within the right temperature, you need to get the best betta tank heater. Getting the right heater should not be a problem as there are many available today. In this guide, we will learn more about such heaters and their overall benefits. How to Add a Heater to a Betta Tank? How to Use Betta Fish Heater? To help answer this question, you first have to know the importance of a heater. Well, the main reason is that fish can be a delicate species. Having the water within the right temperature will go a long way of making sure they are safe. It is not just about the right temperature, but also steady temperature. The fish does not need to be in water whose temperature keeps on fluctuating. In most cases, the water temperature is affected by the air surrounding the tank. This sometimes can lead to fluctuating temperatures. To resolve that, you need to find the right betta tank heater. Studies show that whenever the water gets too cold, it would have an effect on betta fish. They will tend to stay dormant. In such a scenario, you will see them having trouble with eating, swimming, and some could even die. That being said, you can also expect them to have some health complications when the water is too hot. As a result, you need to keep the water within the right temperature. So, what is the right temperature? For betta fish keeping the water between 74 and 82 degrees Fahrenheit should be ideal. It is often recommended to get heaters which will not overheat past this range to keep the fish safe. It will be great if you also have a thermometer. This is because some water heaters do not come with a display of the current temperature. Having a thermometer will be great to keep an eye on the warmth of the water. Also, some look at the manufacturer rating of the water heater. This helps a lot so that you know what kind of temperature the model can operate in before buying. Buying your next betta tank heater should be based on an informed decision. It is why we have come up with a table to show you the comparison. From the comparison, you can quickly tell which model would be ideal for your aquarium. To make it stand out, the SZELAM aquarium heater comes with an intelligent circuit board. The board helps with integrating a precise temperature sensing board and constant heating system. You no longer need a thermometer to know the water temperature. Unlike the other heaters, this one will remain working great within the set temperature. There is no need to manually adjust the temperature. This also makes it energy efficient for those who think all heaters draw a lot of energy. 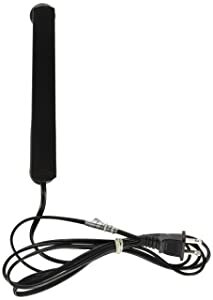 Straight out of the box, it is easy to use. The heater has an automatic temperature regulator which is still reliable. It will easily work even in areas with strong water flow. The guide that comes with it should help with the setup process. You will like the fact that it is made of high-quality material. This includes the heat resistant ABS housing, ceramic heating system, and sandy quartz filler. All these materials point to a heater with great durability and functionality. This is another top option when it comes to the best betta tank heater. This heater comes in different power ratings. You can choose either 50W, 75W, 100W or 200W models. It all comes down to the size of the betta tank among other considerations. The good display helps you to know the accurate temperature reading. Also, you can adjust it to where it is warm enough for your betta tank. To ensure the heater remains working properly, it has an automatic constant temperature function. It works by turning off the heater once it reaches the predefined temperature. This helps not to overheat the water and thus keep the fish safe. It also comes with easy to use controls. You get a touch button and cyclic adjust the temperature. This allows for setting the temperature to the desired position. Also, you should find it safe to use thanks to more safety features. The top warranty of 12 months and 24-hour professional after-sale service should boost your confidence in the product. You will always know there will be help from the manufacturer. For a betta tank heater to be great, it has to be fully submersible. That is what you get with this heater as it is waterproof. Its components will still work great even while submersed in the water. So, what about the aquarium size. 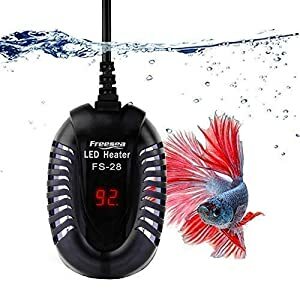 The manufacturer recommended this heater for the 1.5-gallon fish tank. The outer design makes it even tougher than glass. This will definitely improve the durability of the heater. Another good thing about the heater is that it maintains the water temperature within a good range. The temperature can be maintained between 75 to 77 degrees Fahrenheit for the best comfort and growth of your fish. The model also includes the suction cups too. These allow for the ease of installation of the heater. You simply have to attach the cups to the tank. The model comes from a top brand, so you can expect to get the best value for money. Well, the model features indicator lights that help you know if the heater is on. For red light, it means that it is heating while the green light means the proper temperature has been achieved. This model does come with an electronic thermostat. The function of a thermostat is to keep the temperature from going beyond the preset temperature. Well, its preset temperature of 78 degrees Fahrenheit is ideal for most tropical fish. So far no adjustment is needed. The design allows for the heater to be fully submersible. Also, you can either install it vertically or horizontally. Thanks to its small footprint, it will not take up much space in your aquarium. Some even install it behind plant decors. If you are looking for a heater for larger tanks, this is what you need. 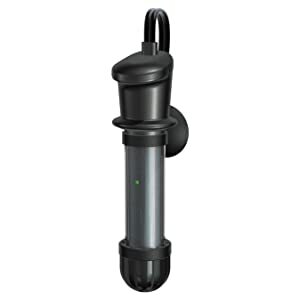 It is designed to work great for aquariums up to 10 gallons. It is amazing how it is able to reach the preset temperature in a short time. The model does work great when it comes to reaching and maintaining a specific temperature. You no longer have to make manual adjustments. Just set it up and turn it on. You might have to get a separate thermometer to measure the water temperature. The durable PPC plastic for its housing promises the best durability. It should be able to remain working great for years to come. Also, the design and use of such material keep it more resilient than glass sleeve heaters. There is also a red light indicator that helps you know that the heater is working. As for the installation, you can use the included suction cup for a quick set up process. You do not have to spend a lot of money on betta tank heaters when this one is available. Thanks to its compact nature, it should work for even the small tanks. Users also love that it can be easily set up within no time. It is a multipurpose heater because it can work for both the fresh and saltwater aquariums. You do not need to buy separate heaters from today. To make it even better, you will find it made of a durable polymer. This enhances the durability of the heater even further. With its 2-year warranty, it is better than what you get with the other models. Also, you should be able to like its reliable performance. The best part is that it can maintain the water temperature of 78 degrees Fahrenheit all the time. No more worries that it will overheat. The first step is getting yourself the best heater in the first place. The best part is that we have reviewed some of the top models above. Well, it should be easy to get one for yourself now. It is recommended to get one that is a submersible water heater. The submersible heater is known for being easy to install and also heats more water gallons faster. 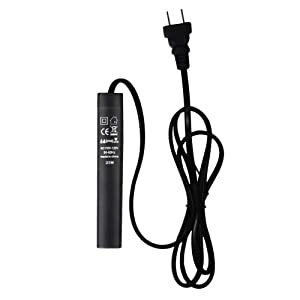 Read the description to make sure that it is a submersible heater. You have to inspect the heater before you can install it. Sometimes it can crack or break during transportation. We all know that water and electricity will not work great. Make sure there are no exposed wires before you can set it up. With the heater inspected and it is in good condition, you can now proceed to the installation part. First of all, find a suitable spot for the installation. It could be even behind the plant decorations to help keep it out of sight. Use the suction cups that come with the water heater to attach it to the tank surface. 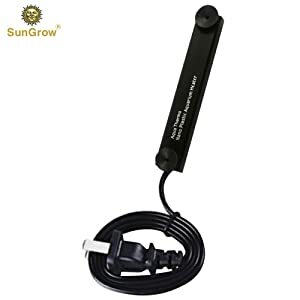 If the heater does not have a suction cup, the manufacturer often provides a mounting bracket. Use the bracket as instructed to set up the heater. Just like that, you should have the heater ready for operation. Just because the heater is in the water, you do not have to turn it on immediately. It is recommended that you let it settle in the aquarium water for about 20 minutes. So, why is this the case? The aim is to allow for the casing to adjust to the temperature change. This is important, especially for the glass casing which prevents it from fracturing. As for the ABS plastic, some you can just turn on immediately. Check the manufacturer’s instructions just to be sure. You can proceed to turn on the heater once it has settled in the aquarium. Most would come with a dial to help adjust to the right operating temperature for the aquarium. Since it is the first time working with the heater, keep monitoring it for the next 24 hours to make sure it is operating correctly. If after 24 hours the heater is working great, you should be satisfied it was the right decision to get it. From the various models mentioned above, it is now easy to know which is the best betta fish heater. Well, your choice might be different from another client. The aim is to get a model that works great for your needs. At least you would know it was money well spent. Also, get a model that will not overheat the water in the tank. Check the reviews to make sure that the model would keep the water temperature within the recommended range. When you get the right model, you should see your betta fish growing and thriving.